At the Carew roundabout take the exit for 'Carew & Haverfordwest', then left for 'Whitehill / Lawrenny', go through Cresswell Quay, over small stone bridge and uphill, until the crossroads, turn left here, through Lawrenny village, turning left at the brown sign for 'Lawrenny Quay'. Follow the road straight ahead, there is ample parking on the waterside. From the A4075 Take the 'Canaston Bridge' exit. 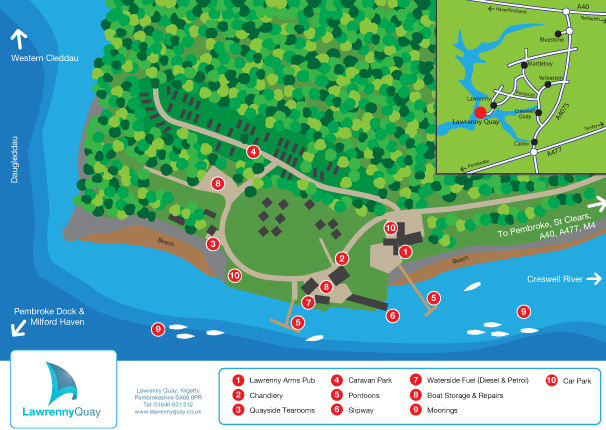 After passing Oakwood, take the first turning right, signposted 'Lawrenny'. Follow straight on, then, just after a sharp left hand bend, take left fork at cottages, signposted 'Lawrenny'. At 'T' junction turn right, at crossroads go straight over. Through Lawrenny village, turning left at the brown sign for 'Lawrenny Quay'. There is ample parking on the waterside.